IC Insights has released its Mid-Year Update of The McClean Report 2013, finding that total microprocessor sales are now expected to increase 8% in 2013 after rising just 2% in 2012. Worldwide microprocessor sales are set to reach a record-high $61.0 billion in 2013 mostly due to strong demand for tablet computers and cellphones with Internet connections. However, the ongoing slump in standard personal computers, including notebook PCs, is once again dragging down overall MPU growth this year. IC Insights’ mid-year forecast trims the marketshare of x86 microprocessors primarily sold by Intel and rival Advanced Micro Devices for PCs and servers to 56% of total MPU sales in 2013 compared to the previous estimate of 58%. 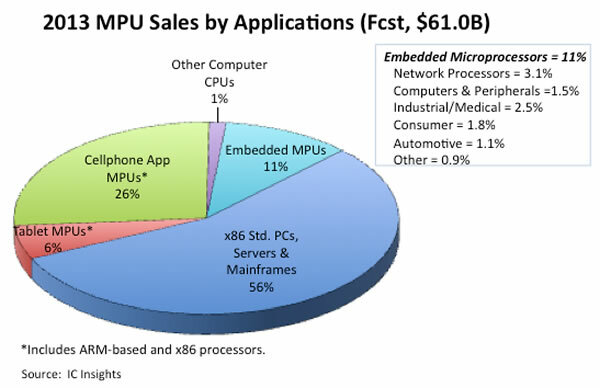 Figure 1 shows embedded microprocessors are now expected to account for 11% of MPU sales in 2013 (versus 9% previously), while tablet processors are projected to be 6% of the total (compared to 5% in the original January forecast). The new forecast keeps cellphone application processors at 26% of total MPU sales in 2013 but lowers the marketshare of non-x86 central processing units in computers outside of tablets to 1% (from 2% previously). The proliferation of multimedia cellphones and the surge in popularity of touch-screen tablet computers are fueling strong double-digit growth rates of MPU sales and unit shipments in these two systems categories. The vast majority of these systems are built with mobile processors based on 32-bit CPU architectures licensed from ARM in the U.K. Many MPU suppliers serve smartphone and tablet applications with the same processor platform design. The falloff in standard PC shipments is a major problem for Intel and AMD since they have supplied more than 95% of the x86-based MPUs used in personal computers since the 1980s. The new mid-year forecast raises tablet processor sales in 2013 to nearly $3.5 billion, which is a 54% increase from $2.3 billion in 2012. Cellphone application processor sales are now expected to grow 30% in 2013 to $16.1 billion from $12.4 billion in 2012. At the start of this year, sales of mobile processors in tablet computers and cellphones were forecast to grow 50% and 28%, respectively. Stronger unit shipment growth in mobile processors has lifted the revenue forecast in these MPU market segments. Meanwhile, the larger market segment of MPUs used in PCs, servers, and embedded-microprocessor applications continues to contract, albeit at a slower rate than in 2012. The mid-year forecast shows sales of MPUs in PCs, servers, large computers, and embedded applications slipping by 1% to $41.4 billion in 2013 from $41.9 billion in 2012, when revenues dropped 6%. This large MPU market segment was previously forecast to rebound with sales increasing 5%, but the anticipated bounce back has been blocked by weak shipments of standard PCs, which IC Insights believes will fall by 5% in 2013 to 327 million systems. While the mid-year outlook lowers total MPU revenues in 2013, it slightly increases the growth in microprocessor unit shipments to 10% this year from a projection of 9% in the January forecast. Total MPU shipments are now expected to reach 2.15 billion devices in 2013, with tablet processors growing 62% to 190 million units and cellphone application processors increasing 11% to 1.50 billion this year. IC Insights’ microprocessor category does not include cellular radio-frequency baseband processors or stand-alone graphics processing units, which are counted in the special-purpose logic/MPR category of the IC market.